My friend Jasmina and I talked to several backpackers before signing up for the 2 hour trek to the summit of Volcan Pacaya, the only active volcano near Antigua, Guatemala. Everyone agreed it was a challenge but worth the effort. One woman described the descent in the dark as sliding blindly on her rump through loose ash the size of gravel because it was impossible to get a firm footing. My outdated guidebook warns of robbers lying in wait for climbers rather than describing the climb itself, a non-issue now that armed police are evident on the trailhead. Since the only shoes I packed are thongs-after all, it is Central America, but even the dumbest tourist knows one doesn’t stomp around on hot, sharp lava rocks in beach shoes- I bought a pair of knock-off-Converse high tops for five bucks at the colorful, local market the day before. When I purchased my ticket for 50 quetzales, the tour person, Sara, told me that for an extra 150, about 15.00 US dollars, one could ride a horse to the volcano. I have wanted to do some horse riding since I began my trip in October but the occasion hadn’t presented itself. Now was my chance. 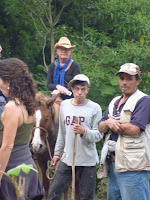 I agreed to pay the horse owner when we arrived at our drop off site, about an hour and a half bus ride from Antigua. The next afternoon while we were waiting for the mini-bus to pick us up Sara told me she had been mistaken; that the cost for horseriding was 175q. Normally I wouldn’t have minded the increase but prices are so unpredictable at every turn here I have grown weary and frustrated of the confusion; besides, I had only 150 on me. I told her never mind. I would hike. She called the agency she works for. OK, she assured me. 150.00. We were back on track. When our driver stopped for gas, he announced that the horse rider-me- would have to pay an extra 25q to ride to the actual volcano,and 25q more to go further, what ever that meant? Completely confused and now pissed, I told him to forget it. I would definitely walk. A short while later we pulled into a small parking area to meet our guide. Prancing around the bus were several –maybe 6 or 7- caballeros acting like a posse on Gunsmoke. They followed our group, circling around us laughing as we filed out and began our trek. Having had a chest cold for several days I was not in my best physical shape nor was I in the mood to suffer their jeers. Coughing and perspiring, I slogged along behind the group, most of whom were at least 25 years my junior and on a good day would have left me in the dust. The posse rode beside and behind me; predators waiting for their prey to tire so they could move in for the kill. Taxi miss? You tired? You want ride? Ha Ha Ha, they taunted. Basta! (enough). I shouted. I concentrated on putting one foot in front of the other. (One alligator at a time, I heard my friend, Bob, whisper in my ear.) I questioned my sanity. No doubt about it, I thought. I am nuts. About that time our guide sidled up to me with a deal. For 75q each way I could ride his horse one way or round trip. His son, Freddie, coincidentally, just happened to be right there holding its reins. Back to the original price. I was simply too ill to argue. As soon as I climbed up onto Lucero, whose saddle and blanket were both in sad need of repair or replacement, the touts dispersed. Freddie led me along the path behind my trekking friends like a kid on a pony. This was not horse riding. I was disappointed but determined to at least enjoy the view until the sun set. At the end of the trail, below the summit, Freddie, asked for his money. I had only 100q. Of course he didn’t have change. Did I mention that no one in Guatemala ever has change? Even when four people travel together and three people have just handed over exact fare, there is never change. I gave him the 100q bill I had. But I’m ahead of myself. After walking up a hill through woods on a narrow muddy path full of jutting roots and rocks for a little over an hour we rounded the side of the mountain. The path at this point was no wider than 3 feet and dropped straight down into wilderness as far as the eye could see. Suddenly, all sense of life seemed to vanish. What appeared to be thick fog but was smoke or maybe a mixture of the two engulfed us. I could barely see Freddie, much less the single file of folks snaking around the curve of the mountain in front of us. The ground began to look as if it were an undulating ocean whose gray water had been frozen in time. Light from a full moon softened the starkness, causing a Dali-esque surreal gleam over it giving the illusion that it might be soft and fun to run through. On the path, Freddie spotted a fat, nearly dead grub. He picked it up with a stick and insisted it-well, maybe not this one clearly off it’s migration course-would turn into a mariposa-a butterfly. Nevertheless, it’s good to see hope in the young. By the time we reached the base of the summit the sun had disappeared. The only light was the bright full moon directly in front, making a path across the desolate landscape. I dismounted Lucero and joined the others for the ascent. Collectively we clamored-sometimes erect, other times on hands and knees- over shifting, loose, sharp lava rocks ranging from the size of peas to basketballs and larger. Pockets of red-hot lava dotted the landscape. To everyone’s amazement every 50 feet or so we came upon a starving dog curled up, asleep in the dirt. Occasionally one would rouse itself long enough to beg for scraps. How they got there is anyone’s guess. 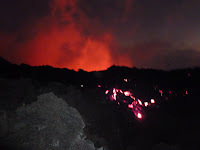 As we neared the top the hot lava generated enough steam to fog my glasses and in spite of my new shoes my feet were hot. The majority of our group had reached the summit maybe ten minutes before I and a few others did. When the guide realized there was this discrepancy in speed among the group he assigned his daughter to guide us. She was, I’m guessing, maybe ten? He had underestimated her abilities; she clearly did not know where the path was. Consequently we found ourselves on the wrong side of a crevasse, maybe 20 feet long, 2-3 feet wide, spouting red flames just a foot or so below us. Alarmed, the child called, Papa! Papa! Papa!. After she had yelled his name six or seven times he came to our rescue. Grabbing his outstretched hand for support, we jumped individually over the flames to the correct path. A short distance away, the midnight blue sky, enhanced by the moonlight, glowed bright red. The ground around us was dotted with eerie patches of fire. Just as we, the stragglers arrived, the rest of our party was leaving. I didn’t even have time to eat my vegetarian Subway sandwich. Groping my way through the treacherous lava in the dar-sandwich in one hand, flashlight in the other, I came upon one of the dogs. I handed it my sandwich. It wolfed down the bread immediately. When it came to the green pepper, tomatoes, onions, cucumbers and jalapenos it looked at me as if it had been deceived. What the hell? Vegetables? But, it ate them. If you are a dog who has acclimated to life where nothing grows, you cannot be picky. After the rapid descent from the summit, part of it sliding on our rumps as we had been warned, the narrow path became a road wide enough for two lanes of traffic in some parts- plenty wide for easy walking. It occurred to me there had been no need to trek up the vertical, narrow, path through the woods, over stones and jutting roots, along a precipice that dropped off into nowhere. In my opinion the trek up the side of the volcano would have been plenty of extreme survivor action. But that is my opinion. The next day Jasmina, who is 33 I think, said, “The trek to the volcano was invigorating, don’t you think? I need to do more of that kind of stuff.” Like I said, it was just my opinion- no way do I speak for the group. Would I do it again? What am I, nuts? This entry was posted in Uncategorized and tagged Travel on December 8, 2009 by rubycoops.